This hollyhock is just gorgeous. As I gaze at it I think one flower is looking back and one is looking forwards……it’s a Janus-like flower! Then I see all the emerging buds entwining the main stalk…..and I think, isn’t that like Life? Don’t we create our personal narratives here in the present, building them out of the past, and with our hopes and expectations of the future? Don’t we need good memory, good imagination and a focus on the present in order to flourish? As a New Year’s Day arrival myself, I love Hollyhocks but never thought of this, very cool! 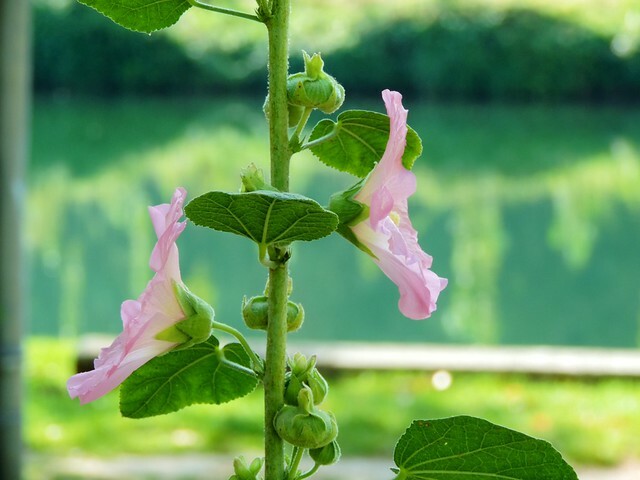 Hollyhocks can often be used like Marsh Mallow (Althea officinalis) or even the ground mallow often called Cheeseweed (Malva neglecta) herbally. Great demulcent/emolient action!